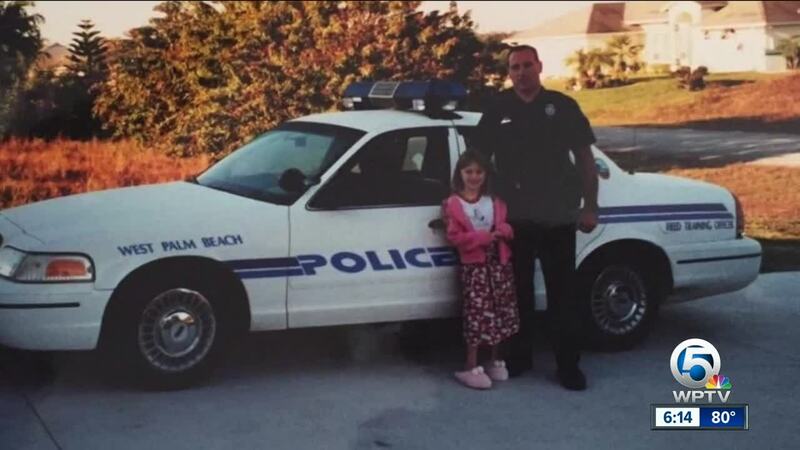 When Officer Thomas Morash was killed in the line of duty 15 years ago, the West Palm Beach Police Department made it their mission to take care of his daughter, Tatyana Morash. When Officer Thomas Morash was killed in the line of duty 15 years ago, the West Palm Beach, Florida Police Department made it their mission to take care of his daughter, Tatyana Morash. "I was only eight, so I don't really remember much," she said. "It's all a blur to me, but having them all there for me is what I do remember." For Morash's brothers and sisters, it's all too clear. "What's really hard is to see somebody....whose 8-year-old doesn't really have the concept of what happened," said West Palm Beach Lt. Frank Distefano. The officers made a pact to always be there. "Growing up, they always told me I always had all these uncles," she said. "I think he'd be proud....proud of all his brothers," she recalled. Tatyana said she remembers bits and pieces. Her father's fellow officers work to keep her memory alive. "Everybody tells me how good of a person he was, and that's how I remember him," she said. The WPBD was there for all the milestones. Birthdays, graduation, even her engagement. Tatyana said the officers put her fiancée in the back of the patrol car and told her they'd release him if she answered one question. She said yes, and now they're all headed to her wedding in Georgia in November. "I have to know he's watching over and it will be a happy day because I don't want it to be a sad day," she said. The honor guard will be at her wedding and a former West Palm Beach police captain will walk her halfway down the aisle. Her mom will do the other half. "We continue to be there, and we plan on being there forever," said West Palm Beach Police Department Detective Ron Robbins. "That became our mission years ago, serving those left behind," said Lt. Distefano. Tatyana said the only thing she can say to her dad's extended family, which is now also hers: "A million times thank you." Now, they're getting ready to be in her wedding and walk her down the aisle.